A SPECTACULAR Hawthorn side has sounded an ominous warning to the rest of the AFL, thrashing Melbourne by 104 points in its round one clash at the MCG. The Hawks won 23.16 (154) to 6.14 (50). Lance Franklin kicked six goals for the winners, who had five other multiple goal-kickers and 10 goal-kickers overall. Sam Mitchell had 34 possessions, while Chance Bateman had 29 and Stuart Dew 25. For the Demons, Russell Robertson had three goals, all in the last quarter, while Brock McLean battled hard with 28 touches. Hawthorn led by 80 points at three-quarter time after kicking eight goals to one in the third term, and had 27 scoring shots to just 12 after three quarters. The Hawks then kicked eight goals to four in a free-flowing final term. Hawthorn exploded out of the gate after half time, with the undoubted highlight being two goals to former Port Adelaide premiership player and new recruit Dew. 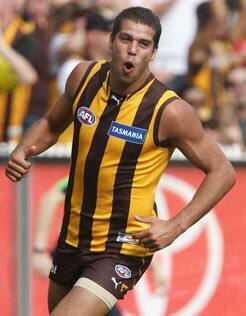 Hawthorn led 7.10 (52) to 1.5 (11) at the main break after taking a 28-point lead at quarter-time. Michael Newton was the only goal scorer for the Dees in the first half. Despite the win, the news wasn't all good for Hawthorn, with Trent Croad leaving the ground for hospital after just four minutes in the first quarter with a wrist injury sustained in a tackle of Melbourne's David Neitz. Hawthorn's Michael Osborne was the only change to the named sides; he came in for forward Mark Williams.